Grandpa's Pride BBQ: Star Wars & BBQ, I Find The Similarities.....Disturbing. Star Wars & BBQ, I Find The Similarities.....Disturbing. 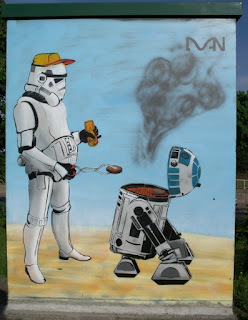 So, the other day I asked my wife if she had ever noticed the parallels between BBQ and Star Wars. Her look was, well suffice to say, it spoke volumes. Probably the same thing y'all are thinking right now. I implore you to stay with me through this jaunt into my inner, nerd psyche. So everyone this side of the moon has seen Star Wars....not 1-3 which sucked. I mean 4-6 starting with "A New Hope." Classic story of an evil overlord and a rebellious young crew led by an older teacher seeking out to save the girl/galaxy. With that in mind, I'm going to describe a character and you fill in the blanks with the first person in BBQ that comes to mind with no one in particular. In psychology, we call that word association. Emperor Palpatine: Evil ruler of the galaxy, everyone bows to him, not afraid to choke out someone, and teaches others the dark ways of the force. Obi-Wan Kenobi: Benevolent and kind, uses the force for good, and teaches the young ones the ways of the force. Darth Vader: Brooding right-hand of the Emperor, evil and powerful in the ways of the force, and may have relationship issues. Han Solo: Wildcard, doesn't follow the rules, is a bit shady, confident, and good at what he does. Chewbacca: Large, powerful, and loyal to Han. Luke Skywalker: Young and unsettled, eager to learn, seeks out a teacher in the ways of the force. Princess Leia: Powerful female, leader of the resistance, sports hair buns like no one else. Jawas: Group of burlap-sack clothed buggers that go around stealing things and passing them off as their own. Sounds a lot like shiggin' to me. Stormtroopers: The emperor's minions, clones, such bad shots they couldn't hit water if they fell out of a boat. Jar-Jar Binks: Character that goes around annoying the snot out of everyone to the point that I was hoping in Star Wars VII he would get a blaster shot to the back of the head within the first :30 seconds of the opening credits a la Casino, but that's just me. Uncle Owen and Aunt Veru: No one in particular but they do get BBQ'ed so there's that. Anyway, hope you enjoyed this look into my world. Y'all take care, and Riley says,"That's no moon....that's a space station."